In 1942, the war began to turn for the Allied forces. In Eastern Europe, the 9th Army braced for almost certain defeat at Stalingrad. The situation was similar for Rommel at El Alamein in North Africa. The US, red with revenge, took offensive action in the Pacific, beginning with the Solomon Islands. Continuing in 1942, the 1st Marine Division took the island of Guadalcanal with little resistance. With Henderson Field secured, things were looking up for the US...until one of the worst possible things happened. The US Navy was defeated in Iron Bottom Sound at the Battle of Savo Island, severing the supply routes to the Marines on Guadalcanal. The Marines had no choice but to dig in for what was bound to be a very long campaign. On the night of August 21, 1942, the movement of the Ichiki regiment was preceded by a native police officer who issued a warning that the Japanese marines were coming and wanted blood and victory. 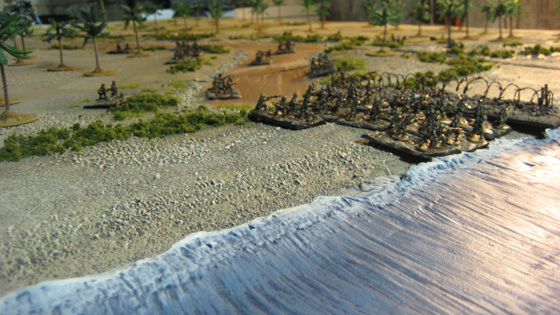 Over 1,000 men of the Ichiki regiment committed to a Banzai charge against Marine positions on the Tenaru River. 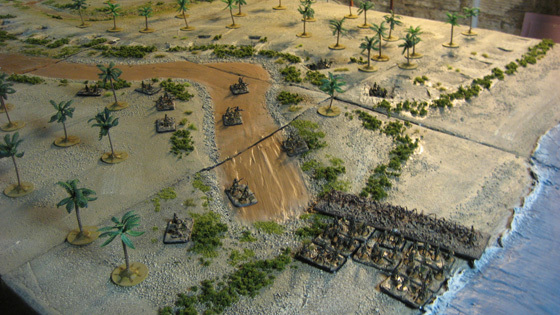 Can the 1st Marine Division hold out and push back this Eastern horde? Uncle Sam needs your help! Follow men like Chicago Native Lew "Chuckler" Juergens, as they defend against the the Banzai attack! Follow the jump for photos of this fantastic board! Tickets for this event are still available (Saturday, 7:00PM - 11:00PM). The Guadalcanal board was assembled by the following members of the Central Illinois D-Day Society/Hotel Kompanie: Scott Curry, James Lemon, Dave Searing, and Dave Cleveland. Old Glory and Battlefront miniatures are being used. Considering there aren't any rules for Japanese that I'm aware of, I wonder what country's army list they're using? We will have new pics in a couple days. I have a question, I don't know the rules for Flames of War let alone Check your Six. However, I am a WWII buff and I would love to play. Can someone who doesn't know the rules get into this without having played? Awesome Michael, I've signed up and I look forward to it. 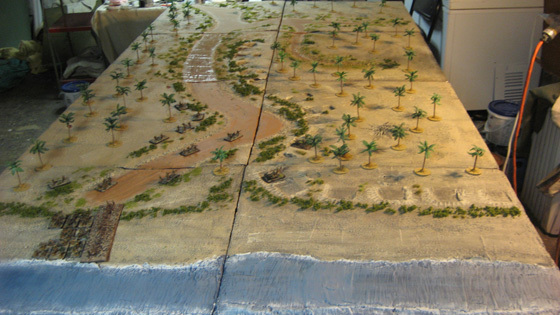 As an aside, isn't there rules coming out for fighting in the Pacific theatre of war? No to my knowledge there isn't. There are rules out written by Dean Wilson he is on lulu.com. What inspired me was meeting a member of the 4th Marine Division and was a Veteran of the Solomons Campaign. Dudley Baurers was a BAR Gunner and took 1/4 of the Tulagi HQ Flag. Later on he was on Iwo Jima and was there to see the Raising of the Flag on Mount Suribachi. Then reading about Chicago Native Lew Juergens, a fellow Steamfitter, and how he and his loader Robert Leickie helped hold off the Japanese attack at the Wire. The whole time remember the Marines were cutoff, and only held a small perimeter around Henderson Field. The Battle of Savo Island nearly cost us the campaign. Like Michael said, don't need to know the rules, they will be taught to anyone who wants to join.. I will be running the CY6 game, it is going to be a Japanese air raid against Henderson field that took place earlier in the day.. defended by the few Marine F4F Wildcats that were available.